Ducati: the Ferrari of the bike world. The passionate red, the quirky V-twins that win against the conventional four-cylinder Japanese plastic rockets, the bikes people put on walls of their uber-trendy Los Angeles apartments, the bikes that seem to stir something in people. Ducati is brave with its designs, punches way above its weight on the street and on the racetrack. It supplies as many bikes as Honda on the MotoGP grid and beat Honda hands down in the opening year of the 800cc era in 2007, despite straying away from conventional motorcycle design. And all from a granite building on the outskirts of Bologna with a dusty old canteen in which you still feel you should pay in Lira for your espresso. 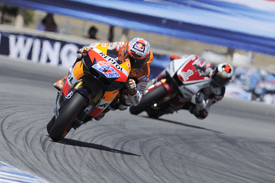 Casey Stoner won 10 races en route to the 2007 MotoGP title, then won seven races with the carbon-framed bike that was introduced in 2009, including winning by a mile on its maiden outing. But let's stop ignoring the elephant in the corner: 2011. 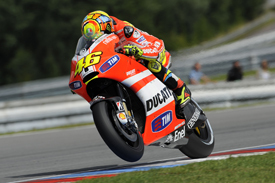 Even with the phenomenon that is Valentino Rossi, it's been a season that Ducati cannot believe. Fourteen races and 42 available podium slots into the season and there's no sign of anything more than the one podium. Nobody had any idea that 2011 would be as fruitless as this, not even after a cynical conversation I had last October with a very wise member of the motorsport community in which we speculated that Rossi might not win a race – based on the strength of Stoner going to Honda and the dominance of recently-crowned world champion Jorge Lorenzo. It was not going to be easy, but nobody expected it to be this hard. So what's changed since the most recent Ducati victory – Stoner's in Australia last year? Rossi turned up, bringing the same guys with him who helped him win all of his previous MotoGP races on 500cc Hondas, 990cc Hondas and Yamahas, and an 800cc Yamaha. 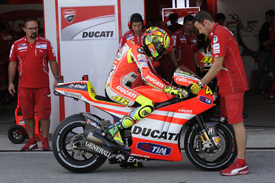 Could the crew working with Ducati make changes to 'un-Stoner' the bike? A glance into the history books reveals that at Honda Rossi and his long-time engineer Jeremy Burgess had the most versatile and amazing racing motorcycle ever built: the V5 RC211V. At Yamaha they had a bike that actually wasn't that far off, as well as Masao Furasawa at every round with his project-leading hand on the tiller. At Ducati, however, Filipo Preziosi may have masterminded Stoner's 2007-winning campaign, but he finds travelling hugely difficult after a terrible off-road crash that has confined him to a wheelchair. Things are not as easy remotely. Out on the racetrack, surely Rossi would be able to ride around all the foibles of the Ducati that all but Stoner had failed to master? This is Valentino Rossi for heaven's sake! Ducati has the financial underpinning of Philip Morris (Marlboro), the experience of knowing how to dominate the World Superbike championship with five different bikes over the years, as well as success in British and American Superbikes. So has it been the lack of meaningful testing that has strangled the proper riders? Factories have riders thrashing around off the pace meaning more than once a 'mega improvement' has been delivered from a test track to be binned after one flying lap by the actual racers. Is the current testing ban too tight for proper evaluation to take place? Is it cheaper to go testing than design a bike on CAD-CAM, build it and then run it with an 800cc engine for the very first time at a race track as we saw last weekend at Aragon? By the time you read this there will be another test being set up at Jerez for Ducati's aluminium frame that again will have to run in 1000cc mode to satisfy the regulations. A 1000cc engine will have inherently different characteristics to the 800cc bike Rossi needs to use for the remainder of 2011 – races that are now an inconvenience to Bologna. They must think these final four races are just a pain in the arse. Looking at the bike technically, some say that the entire concept of the ‘frameless' motorcycle is flawed while, justifiably, others insist it was successful with Stoner. Show me another rider who has won seven races on a carbon chassis Ducati 800? Stoner realised that he had to rag the thing within an inch of crashing at every corner. He worked out that heat was needed in the rear tyre and pushing the front tyre was a risk that needed taking in order to win. Lack of feel through the front was something he was used to from dirt-tracking at home in Australia. He won three of the last six races of 2010 on a Ducati, riding like a demon to the end, but he hated the PR days and the chats to guests in the VIP Village on race day. He wanted to ride and do nothing else; a racer who had nothing else in his mind but tightening up the gloves and doing 210mph down the home straight at Phillip Island. Merchandising, PR, promotional work, journalists and websites are not remotely on his radar. Without wishing to state the obvious, Rossi is a racer too but he must pine for the good old days of testing where he could have a mid-week thrash to just make sure that things were okay, rather than the 'we're all here already so let's test' Mondays. Hell, he even lives in the same country as where they make the bike now. Rossi and his supporters have resigned themselves to not winning a race this season, but are they rearranging the chairs on The Titanic or are they going to scuttle it? There is quite patently no right answer to any of these questions as someone in red would already have done it by now, but what will become apparent is that between now and the season opener next year in Qatar there will not only be another couple of frames built but a million more questions as Ducati fights its way out of this hole.